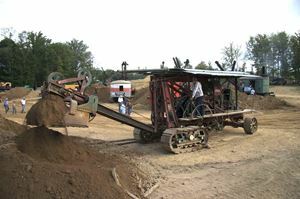 Railroad shovel: 1883 Barnhart Style A, built by Marion Steam Shovel Company. 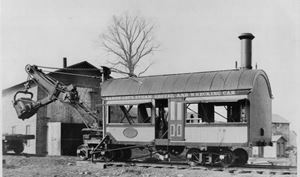 The first power shovels traveled on rails and were powered by steam. The boom swung roughly 90 degrees left or right. Cable backhoe: 1951 and 1954 Bucyrus-Erie 15Bs. 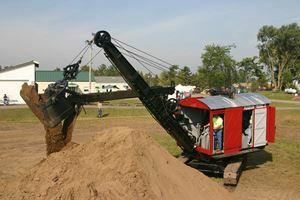 A backhoe digs by lowering the boom and pulling the bucket in and up towards itself, then dumps by raising the boom and drawing the bucket back. Cable shovel: 1926 Marion Power Shovel Model 21. 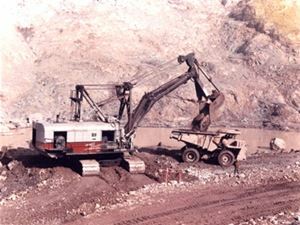 Cable-operated shovels were used in construction until the early 1970s. Most were powered by gas or diesel; this one operates on electricity. Skimmer: 1926 Keystone Driller No. 4. It digs by skimming the bucket along surface, and dumps out the bottom of the bucket. The empty bucket drops back to the foot of the boom for another pass. Tractor shovel: 1928 Wilford Power Shovel Model B. Sometimes applied to wheel loaders, the term describes a cable excavator mounted on and/or powered by an industrial wheel tractor chassis. 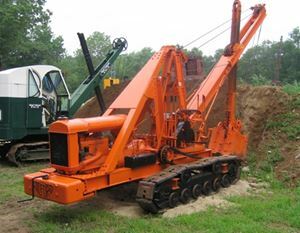 Stripping shovel: 1965 Bucyrus-Erie 1950B. 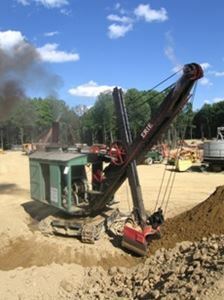 A stripping shovel had an extra-long boom and dipper stick for overburden removal. 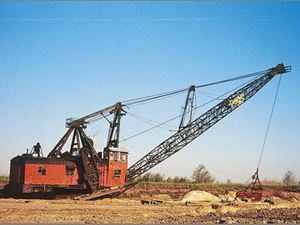 This is one of 37 Super Strippers, shovels that weighed over 2,750 tons. 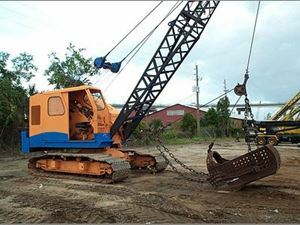 Cable/hydraulic backhoe: Lima 2400, the largest cable backhoe ever built. 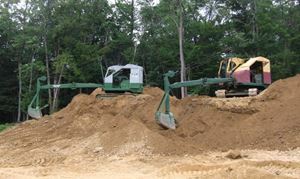 The digging attachment, called a backhoe front, uses a hydraulic cylinder to tilt the 12-yard bucket for extra digging power. 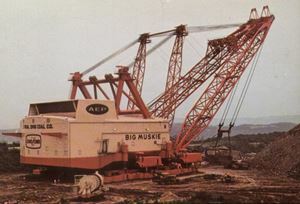 Walking dragline: Bucyrus-Erie 4250W Big Muskie. 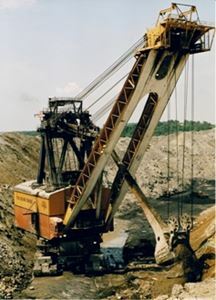 This was the world’s largest dragline during its existence and, at 14,000 tons, one of the world’s two largest land-based mobile machines of its time.